The first Commentary on the Service Regulation (1393/2007) in Greece has just been published. The volume sheds light on all aspects of cross border service within the EU, approaching the topic both from a domestic and an EU-case law viewpoint. 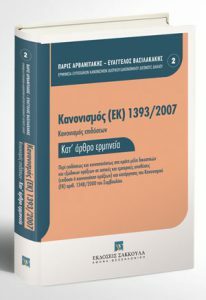 This book is part of an ambitious project, inspired by two of the authors (Prof. Arvanitakis & Prof. Vassilakakis), which aims at publishing a full set of Commentaries on Private International Law EU – Regulations in Greek. The project kickstarted with the publication of the Commentary on the Brussels II bis Regulation (2016). Commentaries on the Small Claims and at a later stage the Brussels I a Regulations will follow. Just got back from an international lawyers conference. There is still much work to be done with regards to this subject.